For this Thanksgiving I’d like to thank all my followers, all my FB friends and all my family who support me, acknowledge me, love me, encourage me and inspire me throughout the year. I’m new here to this blogging world but in the short time that I have been here a member of this vast community, I feel warmth and welcomed and I have a great appreciation for all the new wonderful bloggers I’m meeting. My world is richer because of you. THANK YOU ALL – I honor you and appreciate you and thank you for being a part of my journey. 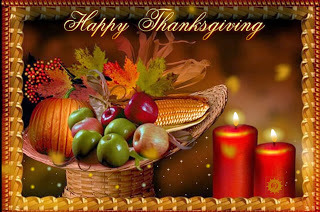 Wishing you all a wonderful Thanksgiving full of joy, love and peace. Love and peace to our world.